Have you ever heard of "trolling for cousins" or "fishing for cousins"? You can use social media like Facebook to find distant cousins. These cousins may have the key to a family tree branch that has you stumped. There's nothing sinister about it. It's a simple way of gaining an introduction and making a new connection. 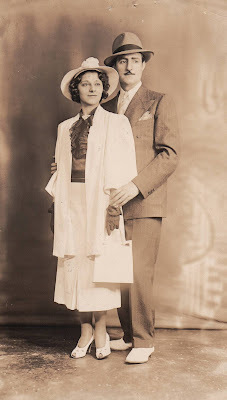 The idea is to post a bit of family history that will interest the cousins you know. Tag those cousins in your post and ask a question. If they don't have the answer, they may tag their cousins from the other side of their family. Engage those cousins in the conversation. Share what you know, and ask them for any details they can offer. Found by accident, I recognized the names! This week I posted a photo I took of a tombstone. It contains several names I knew—the names of my distant cousins' grandmother's family. Her family is not related to me, but they came from my parents' neighborhood. My dad remembers her fondly. I'm very interested in them, so I've documented them in my family tree. But there was one name on the tombstone I didn't know. Luckily, one of the cousins I tagged reached out to her cousin from her grandmother's family. He had lots of answers for me, and his elderly mother gave him even more information to share. 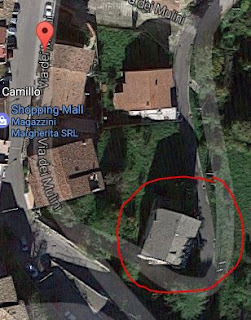 A while ago I used Google Street View to capture an image of the house in Italy where my grandfather was born. I posted it in a Facebook group dedicated to my grandfather's hometown. My goal was to see if anyone knew who lives there now. My grandfather's house still stands. I mentioned my grandfather's last name of Leone. Someone responded that no one with that name lives in town anymore. I replied using the name of a Leone cousin I know, saying that he lives nearby. Then I listed out the names of his siblings. These were names he told me years ago when we first me online. Two of the siblings I mentioned responded, saying "Here I am!" in Italian. Now I have two more connections to my grandfather's town. I'd like to try to meet them when I visit again. Facebook is still a place for those dog and baby photos, and that's great! At no other time in history has it been this easy to reconnect with old friends and find unknown relatives. Remember: Treat any genealogy facts you learn on Facebook, or from someone's own mouth as leads. It's up to you to find the documents that prove the names and dates you may learn from a cousin's cousin. What documents or photos do you have that someone else can help you better understand? 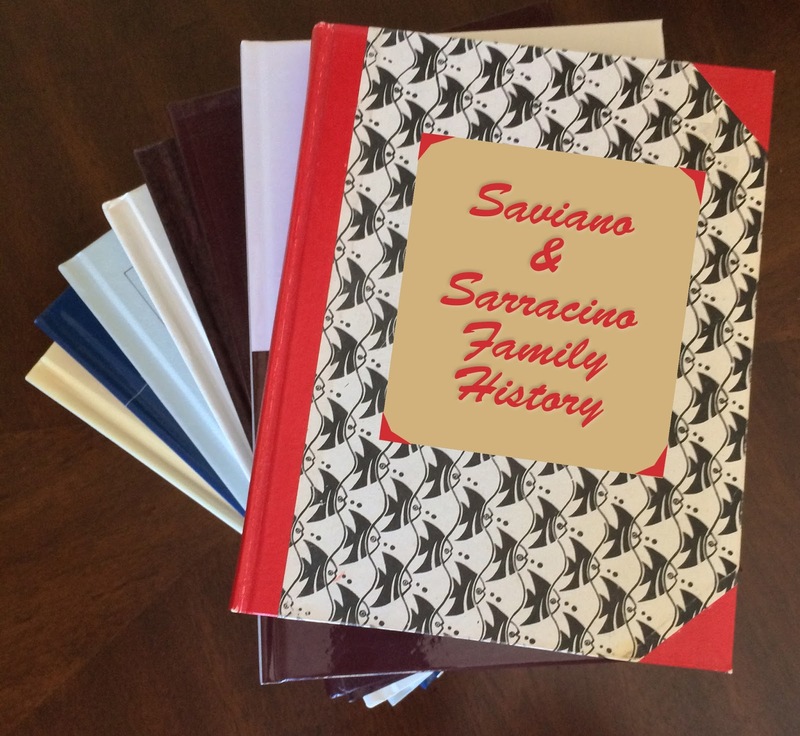 Last time, I wrote about the long and winding journey of my great great grandfather, Antonio Saviano. Since then, I've been trying to find out something more about his life in the Bronx, New York. He lived there with this family from 1898 until his death in 1925.
business with 2 Bronx breweries. I found some newspaper clippings from 1912, 1913, and 1922, but they were not about Antonio. They were about my great grandfather, Giovanni Sarracino. Giovanni was the son-in-law of Antonio. Giovanni's news clippings were about real estate transactions. They each involved the building he owned at the corner of Morris Avenue and East 151st Street in the Bronx. I knew that building. My mom was born there, and it was her parents' home until the 1970s. In these real estate transactions, Giovanni seems to be selling the building, or part of it, to the Westchester County Brewing Company of Pelham, NY. But then he's selling it again as the "agent" of the Ebling Brewery. Saviano wore this ribbon in his coffin. I'm confused. I'm going to have to locate details about those business dealings in some city archive. I was hoping to find that Antonio Saviano was somehow involved in these sales, but I have no proof of that. So, once again, I'm fixated on the ribbon pinned to his suit as he lay in this coffin in 1925. This is the only photograph I have of Antonio. Today I rescanned that 1925 photo at 1200dpi—the highest resolution my scanner can do. I think it's clear enough to read his ribbon now. I used Google to fine-tune what I thought I saw, and find something that matches. Here's what I found: Societá Fratellanza Contursana Di Maria S.S. Delle Grazie. On the ribbon, you can see Societá at the top. Then there are some initials, then Maria S.S., and finally Delle Grazie, Bronx, NY. 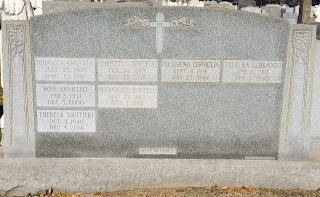 In 1931, after Antonio died, Societa Fratellanza Contursana Di Maria S. S. Delle Grazie, Inc. filed as a domestic not-for-profit corporation. They could have been in existence long before they incorporated in 1931. I learned today that Italians who came to America in the late 1800s and early 1900s formed local mutual-aid societies. These societies helped new immigrants adjust. When I was a little girl, I remember the old Italian men sitting on the sidewalk in the Bronx, playing cards around a folding table. My mom said they belonged to a men's club. Now I feel pretty sure their men's club may have been the mutual-aid society. Antonio's 1925 trail is kinda cold. But I'm hopeful there may be a crack in this case soon! Maybe you started recently, or maybe you've been at this genealogy business for years. Either way, you've learned a lot about your ancestors. You gathered tons of facts—births, marriages, deaths—and piled up a bunch of evidence. You've got ship manifests for your immigrant ancestors. 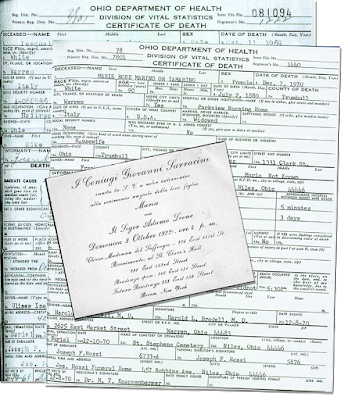 Census records for everyone born before 1940. So much material that no one else in your family knew. How are you sharing all this family history with your relatives? About 10 years ago, I was still fairly new to family tree research. One cousin encouraged me to create a large-format tree to share with my fellow Saviano & Sarracino descendants. I told her, "I've got so much more to find!" She said, "There will always be more to find, but you need to share what you have." I created a 2-foot by 5-foot family tree starting from my great great great grandparents. It goes all the way down to the present day (as of 2007 or so). I went to Fedex Kinko's to have 40 copies printed, which I gave to the heads of the many families on the tree. At that point, everyone from my mother's side of the family knew what I was doing for fun. I became the go-to family historian. But that big poster was all I ever created and distributed. And it is barely the tip of the tip of the iceberg (not a typo). What about the rest of it? How do I share with my relatives the fact that our shared ancestor moved several towns away to marry his wife. Then they moved to the next town. Then they went back to his hometown. And finally they came to America with all their surviving children. How do I let my father's side of the family know that our great grandfather and his brother married two sisters. How do I show them the many trips to America our great grandfather made before retiring in Italy. Giving your relatives access to your online tree isn't good enough. We might love that pedigree view, but where are the stories? Where is my particular grandfather's timeline? We genealogists have an obligation to document our work in meaningful ways. Then we must share that documentation with our cousins, aunts and uncles, siblings, and more distant relatives. If your large family demands more subsets than these, spell those out, too. But each of your grandparents is a great place to start. There will be some overlap. My first cousins—my mother's sister's children—are as interested in our grandmother as our grandfather. So they will want two of my books. But my second cousins have no relation to my maternal grandfather. It's the other book they'll want. In my case, my other first cousins—my father's sister's children—get only one book. Why? Because our shared grandparents were third cousins. It doesn't make sense to make two books out of what's ultimately one family. Try thinking of your family story like a Hollywood movie. My two grandfathers came from neighboring Italian towns and wound up living one block apart in the Bronx, New York. What a marvelous coincidence! Unknowing neighbors in Italy, their children attended the same school in the Bronx and later married one another. That would be a great movie story of parallel lives finally uniting. That's a story to tell in chronological order. Timelines—focus on a specific individual and list his major life events in a timeline format. Include some historical facts to give more meaning to his life. For instance, I'll want to mention the start of World War I because of its profound effect on my grandfather. 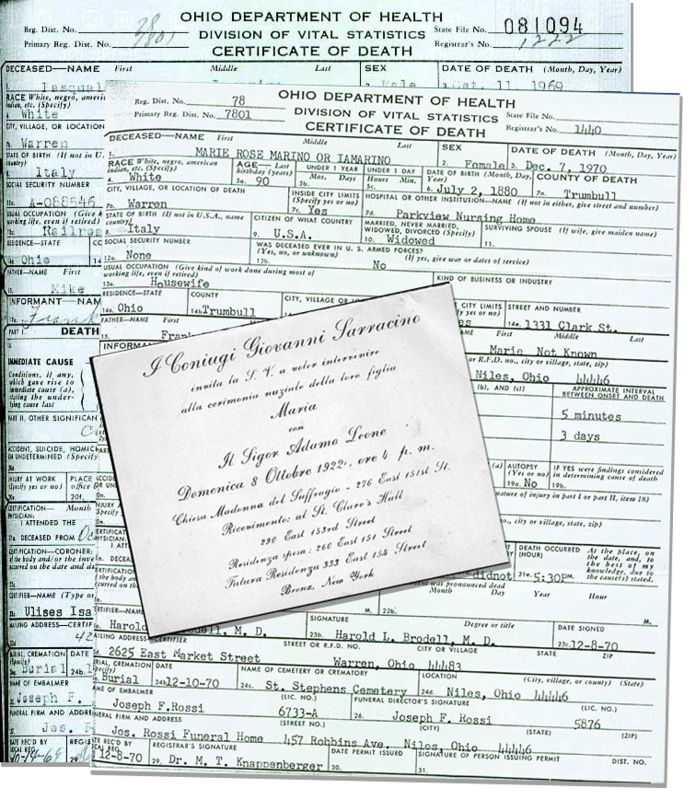 Immigration records—ship manifests and naturalization papers. If you're lucky, you may have a passport photo to share. Photos—your relatives may love seeing a family tombstone as much as you do. Include old family photos that some relatives haven't seen. Sources—include footnotes documenting the source of your facts. A generation from now, a young relative who wants to continue your work will bless you for eternity. Table of contents and index—your relatives will keep your book and look at it now and again. Make it easy to find exactly what they want to find. Tip: Word and other software can create a table of contents and index automatically. If you aren't using family tree software, this is going to be a very tough job. But if you are using family tree software or you have your tree on a genealogy website like Ancestry or FamilySearch, things are easier. Your first step after deciding which books you need to create, is to find a central figure in your story. 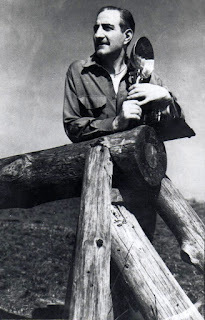 For instance, in my maternal grandmother's book, I would focus on her maternal grandfather. He was my first ancestor to leave Italy and come to America. I think there's a very interesting story there. With your central figure chosen, create a large tree of that person's ancestors and descendants. Or create trees of smaller groupings, such as his direct ancestors and only his children. Create trees that will give the most value to the relatives you want to share your book with. Now gather your documents for this person: birth, marriage, immigration, census, death, and so on. Examine your family tree's facts and documents for this person. As you write out their timeline of events, do any stories present themselves? Does research tell you they emigrated due to religious or political persecution? Was there an earthquake that destroyed their town? Have you discovered your ancestor's first marriage and other children you never knew about? There's an interesting story! Your family tree software may have the ability to create a book with the pieces you've assembled. If not, you can put those pieces together in Word or a desktop publishing program. Anything you can digitize—documents, trees, stories, even video or audio recordings—you can include in a Word document. If your document is far too large to email, put it online and share its location with your relatives. You can use cloud storage that's free. If your document doesn't contain any video or audio, consider having it printed at a local shop or a large store like Staples. You can burn your big book file to a CD-ROM and bring it to the store for printing. Several online services will turn your work into a hard-covered book. That might cost you lots of money if you need lots of copies. This is not an endorsement, but go to Bookemon.com, and you can view sample family history books. You can borrow ideas from their contents and layouts. They also have inexpensive templates and a book price calculator. You know how I didn't want to print my family tree 10 years ago because I'd only just begun? That's the beauty of a strictly digital family history book. You can update, correct, and add to the book at any time. Then give your relatives a link to the "latest edition". Look at you! You're a genealogist, an author, and a publisher! My family didn't pass down any paperwork. There were no birth certificates. No marriage certificates. No citizenship papers. If it isn't digitized, it isn't safe. That's why I'm amazed at the photos other genealogists post of their slumped-over piles of color-coded folders. Their stacks of plastic bins filled with documents. Their rows of acid-free archive-quality storage boxes. I have one fat folder of paper documents related to my family tree. It rests comfortably in my two-drawer file cabinet along with every other piece of paperwork associated with my life. So, wag your finger at me if you must, but I'm here to urge you to digitize your family history! Our goal as family historians is to preserve and share every fact and document of our ancestors' lives. This seems like an overwhelming task to many family tree researchers. But isn't every aspect of building a family tree overwhelming? For goodness sake, you have 64 great great great great grandparents alone! Scanning: A good scanner is not expensive. But if your budget is tight, consider borrowing one for a few days. Or get a free scanner app for your phone. Saving: Your family tree software should have the option of exporting your work as a GEDCOM file. A GEDCOM is a highly compatible format that any family tree software can open and use. Save your work as a GEDCOM regularly. Burn your digital files to a CD or DVD. Copy them to an external hard drive. Store them on one of the many clouds available to you: GoogleDocs, Dropbox, OneDrive. Use FamilySearch.org, Ancestry.com, or another genealogy website to hold your family tree and its document files. As genealogists, we love living in the past. We treasure each scrap of evidence of our ancestors' lives. But we've got to plan for the future and the longevity of our hard work. When it comes to one specific ancestor, like your maternal grandmother, you only want one. But when it comes to preserving her documents and photographs, redundancy, redundancy, redundancy!